Calvin klein Long Red Maxi Halter Evening Gown Fits Size 4 S XS NWT. Condition is New with tags. Shipped with USPS Priority Mail. Elegant Calvin klein Full Length Red satin Evening Gown. Beautiful red evening gown, never been worn. Tight in bodice then flows slightly with small train in back. Color is magnificent in person. It’s a size 10 bu t fits on thesmaller sideo f a 10. Celebrate among the azaleas and roses with the Free People Garden Party Burgundy Floral Print Maxi Dress! Tiered skirt cascades to a maxi length. New Free People Garden Party Maxi Dress Tiered. Hand Wash Cold. About covet clothe. Absolute stunner! A party perfect piece. Ruffled neckline, tie waist detail, midi length. 92% poly, 8% spandex. Color is navy blue. Size is large. The perfect little sequin dress. Petit fit. Hem line is slightly longer in the front for “modesty”. LILLIE RUBIN. WAIST: open/ free. LENGTH: 42". PALE GRAY EMBROIDERED LINEN LINED MAXI DRESS. make Supersized seem small. LENGTH FROM UNDER ARM 46" DEEP SIDE SLIT ONE SIDE. Get images that. New with tags, never worn. Sleek satin falls from crisscrossing adjustable spaghetti straps, into a draping neckline and backless bodice. Fitted waist and figure-flaunting sheath midi skirt with side slit. Hidden side zipper. Front of bodice is lined. 100% Polyester. Hand Wash Cold. Has a shift cut, basically straight up and down. surprisingly well made dress by Forever 21 under their black label. labeled size SMALL, which seems pretty accurate. Thank you for your interest! Cute dress that can be dressed up or down with a cardigan or denim jacket! Please see all photos; item is as seen in photos -close ups show signs of detail/flaws/wear; if any are present/visible FAST SHIPPING!!! Any questions? Please don’t hesitate to ask. Also check out my latest listings! ANNA SUI IVORY WITH BLACK CHANTILLY LACE OVERLAY MINI DRESS. Burlesque / Pinup / Fetish / Babydoll. SIZE 0 / XS /XXS. Cache Royal Blue Beaded Embroidered Gown Maxi Dress Size 2 So Stunning!!! Cache Dark Blue Beaded Embroidered Spaghetti strap Gown with sheer overlay. Maxi Dress Size 2. This dress is stunning, the pictures don't do it justice at all! It has been worn 2x - maybe. Has been dry cleaned. Very good preowned condition - no holes, stains or flaws. BLACK SEQUIN FRONT, plain back, rusched sides. Marked XL ( but that's Junior WILL FIT 10-13. Length ( adjustable depends how you tie the back bra to hem is 31". ). May have been worn once. Beautiful dress. New with tags, never worn. Bias cut, slinky, woven satin falls from skinny straps, into a draping, cowl neck, sleeveless bodice, and figure-skimming slip silhouette. Unlined. 100% Polyester. Hand Wash Cold. From Maria Korovilas website This dress is a hand-beaded work of art. The original beading design was inspired by Maria's favorite textile designs snagged from her portfolio and pieced together as a patchwork motif. , and working buttons down one side detailed with crochet lacework. 100% Silk shell, dry clean only. Armpit-to-armpit: between 16"-16.5". Purple-brown color. New without tags, size 0! Gorgeous silk dress from winter 2016 rollout. Original price $500 Details - V-neck - Sleeveless - Crisscross spaghetti straps - Side hidden zip with hook-and-eye closure - Strap detail at waist - Allover print and metallic detail - Padded - Lined - Approx. 59" length (size 2) - Imported Fiber Content Shell: 80% silk, 20% metallic Lining: 100% polyester Care Dry clean Additional Info Fit: this style fits true to size. Model's stats for sizing: - Height: 5'9" - Bust: 33" - Waist: 24" - Hips: 34" Model is wearing size 2. Runway piece. All over red, blue, yellow green floral print to resemble Monet's watercolors. 100% satin. Square neck. Size UK10/US6. Concealed zip at back. Loose at hip. Tebi teal green dress with much applique work done in lace both light and dark brown. Spaghetti straps have lace. Bust has lace.The hem has lace all around. Teal fabric is ruched around ribcage with lighter brown applied. Hidden zipper under right arm. Built in underlay. Made in Turkey.Dry clean. Size 40. Luxe Velvet Maxi Tank Dress by BCBG in their "Malory" Model in their "DKAMAZON or Dark Amazon" Shade. Velvet- 70% Rayon, 20% Silk. Contrast- 100% Polyester Silk Georgette. Lining- 100% Polyester Micro Georgette. About covet clothe. Absolute stunner! A party perfect piece. Ruffled neckline, tie waist detail, midi length. 92% poly, 8% spandex. Color is navy blue. Size is small. Style: Sheath. Dress Length: Above Knee, Mini. Size Type: Regular. Color: Black. Size 18 by DRESSBARN WOMAN. Beautiful elegant silk tea dress with bias cut hem and layers of silky fabric. A Excellent -- 100% Silk / Lining 100% Polyester. Item shows more obvious signs of wear. Airy chiffon overlay dress with tonal beading ~ Fabulous Color, Flirty, Flattering, Feminine. Manufacturer: Laundry by Shelli Segal. Fabric Type: Chiffon. Silhouette: Shift. Lining: Polyester. Dress Length: Above Knee, Mini. NWT NU COLLECTIVE TIERED GREAT GATSBY FLAPPER TIERED DRESS--S! 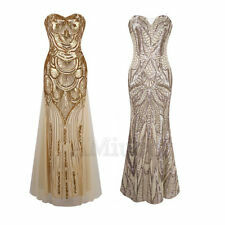 A WONDERFUL NU COLLECTIVE GREAT GATSBY FLAPPER DRESS! HAS AN ATTACHED WHITE COTTON KNIT LINING. ABOUT KNEE LENGTH OR RIGHT ABOVE. Great condition! -sequined black dress with White Chiffon around Shoulder and Neckline. Darted breast area for nicer fit. -form fitting. Fully lined. Need more photos?. This dress is very pretty and elegant not too casual yet not too formal. Great for any occasion! Queens Court Ceremony, size 2, slim fitting, about knee length maybe a little higher depending on your height. Angled cut at bottom, with a silky fabric underneath with a sheer overlay. Tiny zipper in back. I'm not sure exactly what the fabrics are.....the tag is in a language I'm not even going to pretend I know so I'm doing my best :) It's in fabulous condition and fits amazingly! If it still fit me I wouldn't be selling it. Adorable Shiny & Sparkling Red Satin GoGo Flapper Dress. Length: 39" including last row of fringe. Dress is fitted with darts.